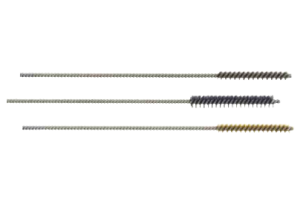 Our Twisted Miniature and Micro Miniature brushes are single-stem, single-spiral and are manufactured by twisting a single layer of filament between two stainless steel or galvanized stem wires. These brushes can be made with a loop for hand use or with a cut off end for power use. 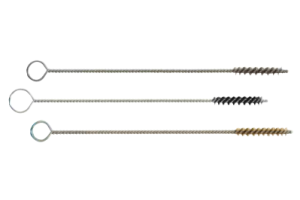 We offer many different standard Twisted Miniature brushes, all with a stainless steel or galvanized steel stem and brass, stainless steel or nylon filament. 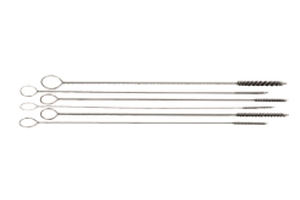 The brushes come in various brush and filament diameters and lengths. Tanis can also custom design Twisted Miniature and Micro Miniature brushes to meet your application needs. These brushes are most effectively used for ultra-fine finishing, deburring, reaming, polishing and internal cleaning applications. Manual or power use cleaning can be accomplished with precision and ease on metallic and non-metallic surfaces with these brushes.